In the secondary research process, various sources have been referred to for the identification and collection of information for this study. These secondary sources include annual reports, press releases, and investor presentations of companies, white papers & certified publications, Factiva, Bloomberg, Businessweek, International Geosynthetics Society (IGS), Waste Atlas, British Geomembrane Association, the European Geomembranes Association (EGMA), and British Geological Survey. 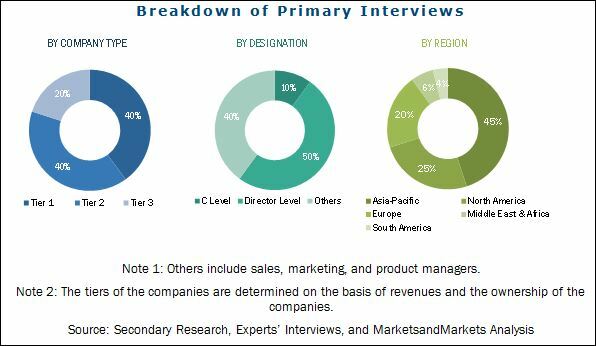 In the primary research process, sources from both, the supply and demand sides have been interviewed to obtain qualitative and quantitative information. The bottom-up approach has been used to estimate the geomembranes market size, in terms of value, on the basis of the applications, and region. The top-down approach has been implemented to validate the market size, in terms of value. Through the data triangulation procedure and validation of data via primary interviews, the exact values of the overall parent market size and individual market sizes have been determined and confirmed in the study. The figure below provides a break-up of the primaries. Major geomembrane manufacturers are, GSE Environmental, LLC (U.S.), Solmax International, Inc. (Canada), Agru America, Inc. (U.S.), Atarfil SL (Spain), NAUE GmbH & Co. KG (Germany) , Officine Maccaferri S.p.A (Italy), Colorado Lining International, Inc. (U.S.), Plastika Kritis S.A. (Greece), Firestone Building Products Company, LLC (U.S.), and Carlisle SynTec Systems (U.S.). The report segments the global market of geomembranes on the basis of raw material, manufacturing method, application, and region. It provides a forecast of the market size, in terms of value and volume, and an analysis of trends in each of the submarkets. The global geomembranes market is projected to reach USD 3.41 Billion by 2021 at a CAGR of 9.2% from 2016 to 2021. The geomembranes market has witnessed high growth in the recent years. Geomembranes, due to their functionalities, such as excellent chemical resistance, ability to withstand an elevated temperature range, low permeability, weatherability, UV resistance, and high tear and puncture resistance, are used in a wide range of applications, including waste management, mining, and others. The main types of geomembranes are HDPE, LDPE & LLDPE, PVC, EPDM, and PP. The HDPE geomembranes type is estimated to have led the geomembranes market in 2016, due to the suitability of HDPE geomembranes in several applications. HDPE geomembranes is expected to be the largest and the fastest growing application during the forecast period, due to its increasing adoption in waste management owing to the stringent regulations for environmental protection. The demand for HDPE geomembranes is very high in all regions due to its ease in availability and low manufacturing cost. Geomembranes are used in applications including waste management, mining, water management, tunnel lining, and others, which are the main applications considered in the report. The waste management segment led the global geomembranes market, in terms of volume, in 2015, owing to the increasing demand for geomembranes in waste management applications such as landfill liners. North America, Europe, the Asia-Pacific region, Middle East & Africa, and South America are the key markets considered for geomembranes in the report. 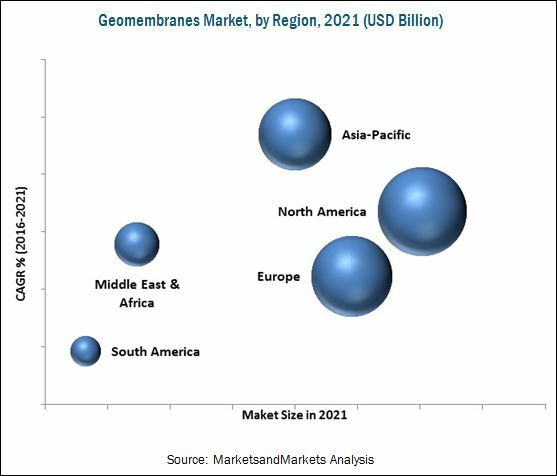 North America is expected to lead the geomembranes market, owing to the rising demand for geomembranes, driven by their increased use in the waste management and mining industries. Europe is the second-largest consumer of geomembranes, globally. Also, the stringent regulatory framework for environmental protection is driving the demand for geomembranes in various applications, such as energy, oil & gas, coal ash containment, agriculture, civil, liquid containment, concrete protection, spill or secondary containment, athletic, environmental, and industrial applications. The geomembranes market is expected to grow at a high rate in the coming years. However, factors such as the fluctuating prices of raw materials may hinder the growth of the market. 11.7 Colorado Lining International, Inc.